Customers; Please note that these coins will be professionally cleaned and from years of our choice, all of which will range from 1849 to 1854. During its mintage period between 1849-1889, the $1 US Gold Coin underwent two revisions, one in 1854 and another in 1856. This resulted in the United States Mint producing three separate versions or “types” of the dollar coin. Featured in this collection is the Type I version of the $1 Liberty Gold Dollar coin, which was produced from 1849 and 1854. Each of these dollar coins contain a gold composition of .048375 oz. They are in “cleaned” condition, which means that all traces of dirt or residue have been professionally removed from their surfaces. Please be advised that while the actual condition of each cleaned coin will vary, their newly cleaned surfaces will enable customers to view them at their fullest potential regardless of their official condition. 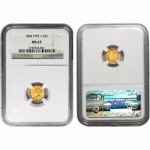 As a means of protecting their cleaned conditions from any further deterioration, every coin is shipped in plastic protective sleeves or coin tubes. The obverse of the Type I coin is engraved with James B. Longacre’s Greco-Roman inspired rendition of Lady Liberty. She is depicted in profile with an inscribed crown placed in her hair. It was named the “Coronet,” after the eponymous headpiece. Her portrait is surrounded by a ring of thirteen stars. These were meant to symbolize the members of the original thirteen colonies. 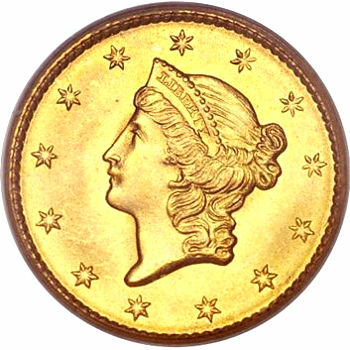 Whether for its artistic or historical merit, this Type 1 version of the $1 Liberty Gold Coin is an inspiring piece of American history that is certain to complement any collection. To request more information regarding this particular coin, give us a call at 888-989-7223. Our staff is also happy to assist you through live chat or email.